– Mother’s consent, marriage certificate and birth notification. Place of registration The main centres of civil status are established at the level of all municipalities, embassies and consulates. The secondary centres, under the control of the main centres, are located in the villages and neighbourhoods. Process for establishing vital statistics on births After the vital events have been registered, the civil registrar sends the declaration of birth to the representative of the State within 15 days. Fifteen days after receipt, the representative of the State transmits this information to the representative of the State in the region. 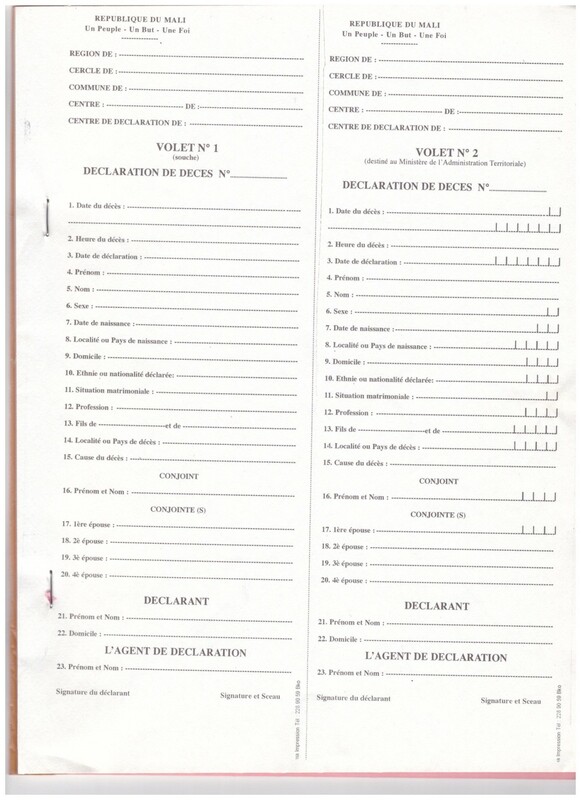 The representative of the State in the region or in the District of Bamako transmits quarterly to the minister in charge of civil registration. 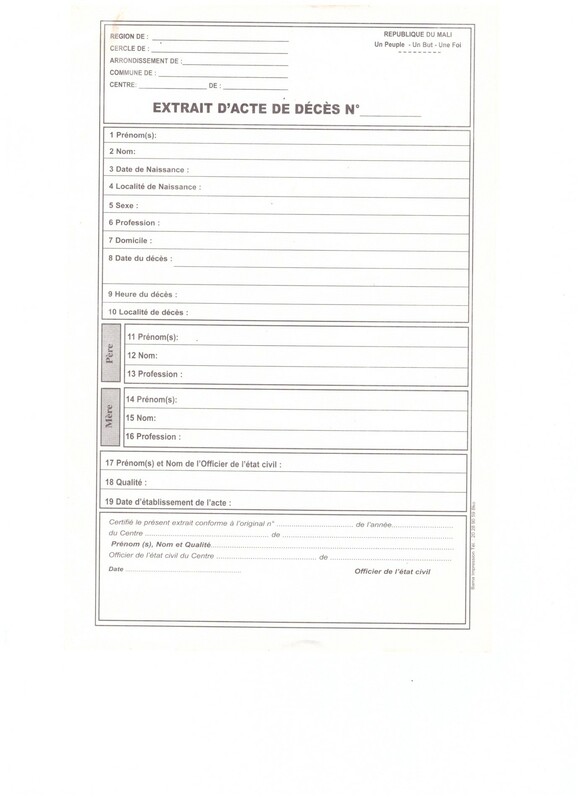 These documents are then forwarded to the Statistical Office (INSTAT) for exploitation. Marriage is celebrated either by a civil registration officer or a religious minister. 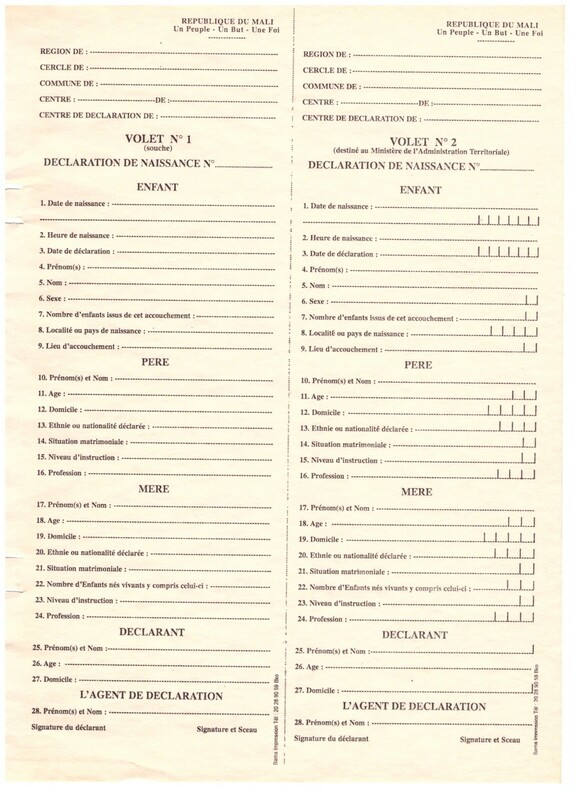 In the first case, the marriage is registered by the civil registration officer; in the latter case, article 303 states that the religious minister shall transmit to the registrar of the place of celebration the second original of the marriage form within 15 days (Code of Persons and the Family, article 280). 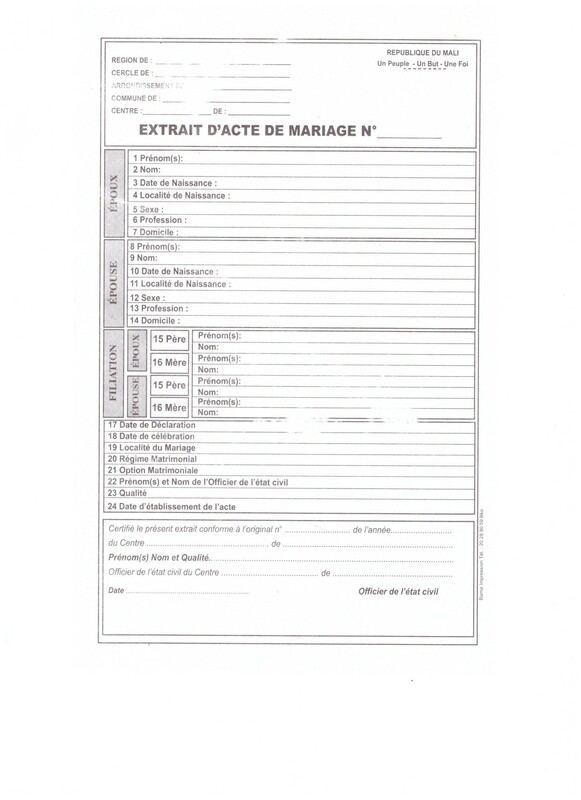 Additional registration requirements or fees if one spouse was born outside the country or has dual citizenship The Malian civil registrar called to celebrate the marriage of a Malian and a foreigner must demand from the foreign spouse the justification of her or his marital capacity under her or his national law. It must also ensure that the publications provided for by the Code of Persons and the Family have been made in Mali and, where applicable, abroad, and that the regulations governing the stay of foreigners do not preclude the celebration of a wedding. – Full name of the registrar or minister of religion. Process for establishing vital statistics on marriage After the vital events have been registered, the civil registrar sends the declaration of birth to the representative of the State within 15 days. Requirements for death registration The declarant must provide the civil registration officer with all the information in his or her possession, the identity of the deceased and, if possible, present the identity documents found on the deceased. Process for establishing vital statistics on deaths After the vital events have been registered, the civil registrar sends the declaration of birth to the representative of the State within 15 days.